Thanks a lot to Roy in a detailed explanation and drawings !!! As soon as I work, I'm sending the picture to the forum. What to put on top of each small 75 mm drains in a bottom of each chamber? Just one more question. Do I leave the wall skimmer opening where is and whether I connect it with the pipe of bottom drains? You should be able to buy bottom drains in different sizes. I think you can buy them in 75mm, I will check to make sure. Alternatively you can make them just like where the bottom drains come up in the first chamber, but saw them off at ground level. Later you can pour your floor around the drain. So in this example, a piece of 75mm PVC enters the chamber horizontally (just below the floor/wall of the filter chamber), at the middle of the chamber a 90 degree elbow is glued on, then a short length of PVC can stick straight up and function as the drain. Perhaps the elbow is enough, it depends on the placement height. About the skimmer; You can use that space just fine. But there is something you need to pay attention to that is indeed not visible in the drawings. Each 110mm bottom drain needs its own 110mm PVC drain line into the first chamber. If you combine these drains you will cut your capacity in half. One bottom drain can pass 8000 litres an hour with an Airlift system. If you use two this means your theoretical max. yield is 16.000 liters. In my drawing the drain pipes are on top of each other, but you can also place them side by side. It depends on what will be easier when you are building. Another thing to keep in mind; Keep bends to a minimum. If you can finish your bottom drain pipe with two bends this is always better than using three or four. Also, only use 90 degree bends when you absolutely have to. Smaller angles cause less drag. So about your skimmer, try to build it into the wall and build another 110mm line which also ends in your first filter chamber. In this case I would enter the first chamber horizontally near where your waterline is going to be. This is beneficial because the skimmer is going to draw in floating debris that we want to keep away from the Crielsieve. This can be done by building a small frame in the first chamber, I will assist you with that when you get to that stage. Also, make sure to place the skimmer outlet near the right side of the first chamber (next to the bottom drains). 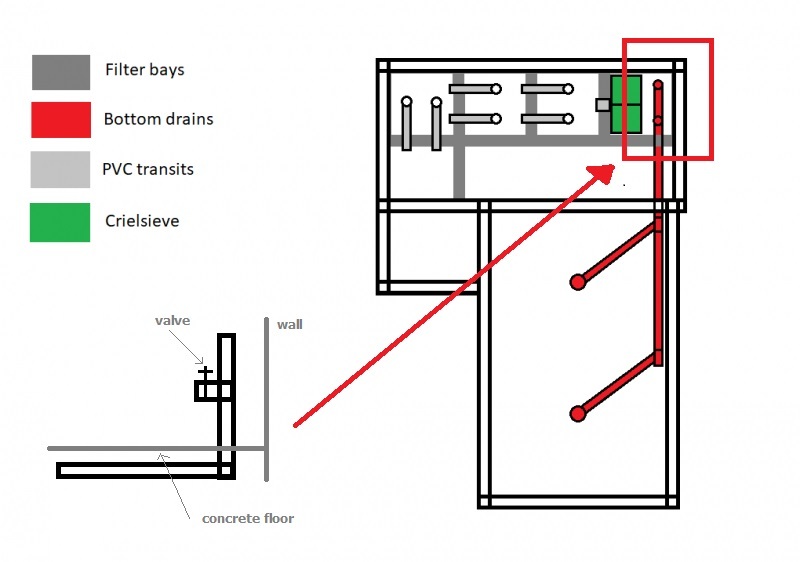 I'm interested how to make entrance from the bottom drain to the first filter chamber ? Is this pictures correct ? Is there a need to place the valve ? Sorry for the late reply, I was busy and then became ill a couple of days ago. I will ask Marc about the valves to be absolutely sure. It appears that the vast majority of the pond construction I see has filtration based on several baffles, sieves and the drum (drums are great). There seems to be a large construction component here as well as cost. Has anyone looked into bubble bead filtration? I am planning on using a system like this for my aquaponic build. The filter uses beads that filter solids and also provide biological surface area for nitrification. Costs can be in the thousands of dollars (US) but it's a two for one filter with easy maintenance (you drain sludge from the filter on a maintenance interval) and the water quality provided is remarkable, with solid filtration down to 50 mircon at up to 60% of all solids captured. Just information. I do not own or endorse any of these systems, yet. But I have dived deep in research and my findings are that if I am going to have aquaculture as a component to my plant growing system, this is the only system that is worth pursuing. The pond builds that are up on the site have been quite high end specialised builds up until now (especially the ones by Koi Gin and Smetjen). Koi pond builds in the Netherlands and Belgium (from what I've seen, in the UK as well) often have a more extensive construction component. As rectangular deep pond builds are a good way to get a large volume of water in a smaller area of the garden. If you want to have a rectangular build, the obvious choice is to use some type of concrete base and building your walls on top of that. This also prevents your bottom drains from moving and the straight walls make it easier to place inlets, outlets and skimmers. All in all it's just a really clean and solid way to build a pond. While the initial cost of building a pond this way may seem high, there are some variables that can have a large impact on the cost. By that I mean the size of transits, fibreglassing the pond or using a liner but also the amount of DIY involved. Some corners can always be cut to save money, depending on what matters to you. In my opinion constructing with cinder blocks is a good way of building a solid pond. It takes a bit more preparation but once it's done your efforts, expenses and planning will repay themselves in the form of energy savings. The fact of the matter is, that if you want to run a pond cheaply, you need to eliminate discharge head from your system anyway. This means you need a raised pond (which always requires some form of construction) or a level pond with a filter at the same height. Buying filter bays is always really expensive, so at that point you might as well build your filter bays. I have looked into making my own filter bays with barrels, but if you want to use Airlift you need large transits, and large diameter transits are incredibly expensive. The cheap alternative is just simply cementing a piece of regular pipe in the wall. If you're going this route, which many people do and have done already, you have a solid pond with a gravitational filter. At that point the pond is suited to be run with an Airlift, and installing a Crielsieve is a good, relatively cheap way to keep solids out of your bio chamber(s). Maintenance can also be varied depending on your stocking level and the size of the holes in your sieve elements. Having said that, the system you mention sounds interesting and I do believe it will be effective for your purposes. It all depends on what you're willing to spend and how much you're willing to invest in terms of filter maintenance. Automation can remove a large part of that maintenance.